The Photographic World of Drew Gardner: Drew Gardner Workshop 22nd and 23rd June, hosted by Frank Doorhof in the Netherlands. 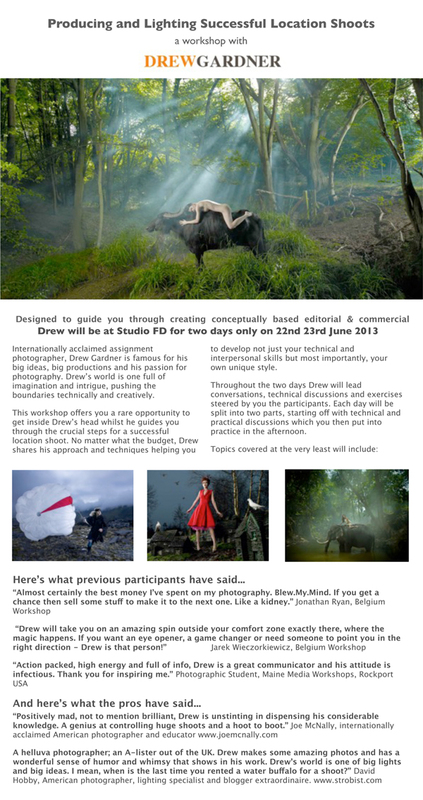 Drew Gardner Workshop 22nd and 23rd June, hosted by Frank Doorhof in the Netherlands. While Frank and Anneweik Doorhof were over in the UK for Focus on imaging they dropped in for dinner. I'm excited as it is my very first workshop in the Netherlands and it will be over two days. If you are on a budget you can book for one day, though the better value two day option will suit others. You can book on Frank's website here. It will be very special. I an sure this will be great and wish I could join. Alas, school graduation weekend here and I am booked. Look forward to the full report. Frank is so good and you two should make quite a team! Adobe CC - Hero or Villan?